2. 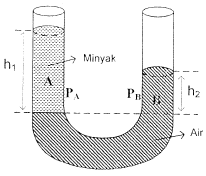 A U pipe is initially filled with water than on one pipe filled with oil, as shown in the figure below. The density of water is 1000 kg/m3. If the height of oil is 8 cm and the height of the water is 5 cm, what is the density of oil? 4. A pipe U filled with water with density of 1000 kg/m3. One column of pipe U filled with glyserin with density of 1200 kg/m3. If the height of glyserin is 4 cm, determine the height difference of both columns of the pipe. Wanted: The height difference of both columns of the pipe. 5. 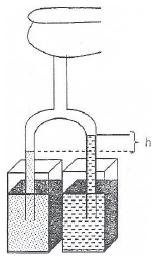 A pipe U has two ends are open filled with water with a mass of 1 g/cm3. The sectional area along the pipe is the same, that is 1 cm2. Someone blows on one end of the foot of the pipe so that the surface of the water at the other foot rises 10 cm from its original position. If the acceleration due to gravity is 10 m/s2 then determine the force acted by that person. Change all units to the International system. Wanted : Force (F) acted by the person. 6. A Y-shaped tube is inserted upside down so that the left foot and right foot are immersed in two kinds of liquid. After both feet are immersed in the liquid, then the top of the Y pipe is closed with the finger and pulled upwards, so that the two legs of the Y pipe are filled with a column of different high-density liquids. If the density of the first liquid is 0.80 gram.cm-3 and the second density is 0.75 gram.cm-3, and the lower liquid column is 8 cm, then determine the height difference between the two liquid columns on U pipe. 7. A stone with the volume of 0.5 m3 placed in a liquid with the density of 1.5 gr cm–3. Acceleration due to gravity is 10 m s-2. What is the buoyant force? 8. A block of ice float in the sea as shown in the figure below. The density of sea is 1.2 gr cm–3 and density of ice is 0.9 gr c–3. The volume of ice in sea water = ……. x the volume of ice in the air. Wanted: The volume of ice in sea water = ……. x the volume of ice in the air. The volume of ice in sea water = 3 x the volume of ice in air (3 x 0.25 = 0.75). 9. An object float in a liquid where 2/3 of the object in the liquid. If the density of the object is 0.6 gr cm3, then what is the density of water. 10. A wood float in water, where 3/5 part of wood in the water. If the density of water is 1 × 103 kg/m3, what is the density of wood?